Israel Juarez is a driven, passionate young man, talented musician and expressive poet. His personal tagline — Great Hopes and Dreams — gives a glimpse into how he approaches life and his aspirations. Israel’s life path was not so clear five years ago. At 16, he dropped out of school and eventually ended up in jail. 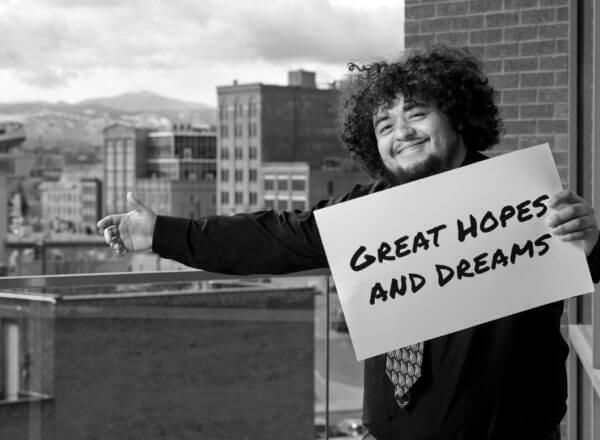 Israel struggled to get on a positive trajectory until he connected with the Denver Opportunity Youth Initiative. Israel is one of 9,000 young adults in Denver, aged 16 to 24, who are disconnected from school and/or work, referred to as “opportunity youth.” The Denver Opportunity Youth Initiative is working to re-engage this unique population by connecting them with career paths and the education they need to get there. Central to its success is collaboration among disparate groups that historically have not worked together – workforce agencies, school dropout programs, community colleges and more. The collaborative approach is working. Opportunity youth numbers in Denver have decreased 10 percent, and people like Israel are the proof. Israel now has a great job and is finishing his GED. He hopes to be the first in his family to attend college and is helping other youth like him find successful paths. Rose Community Foundation launched the initiative in 2013 with funding from the Aspen Institute. “Beyond grantmaking, we’ve learned over the years we can make significant impact by using our relationships and resources to open doors, start conversations and assemble collective funding — to foster the evolution of new ideas,” explains Janet Lopez, Rose Community Foundation senior program officer for Education. That is how this initiative came about. It’s also how the initiative found a new home in 2016 when the Denver Metro Chamber of Commerce, whose mission is to get Coloradans into great jobs, took ownership of it. A $100,000 grant from the McCormick Foundation Fund supported their adoption of Denver Opportunity Youth Initiative. “While we had the ability to help incubate this project, we knew that an organization with connections to the workforce was the best fit to connect these young people to jobs in the future,” says Lopez.